The Museum is open every day except Thanksgiving and Christmas. Regular hours are 10 a.m. to 6 p.m. Tuesday through Sunday and 12 p.m. to 6 p.m. on Mondays. In the event that a Museum-observed holiday–such as MLK Day, Memorial Day, Labor Day, Fourth of July or New Year’s Day–falls on a Monday, the Museum will open at 10 a.m. The last ticket of the day is sold at 5:15 p.m.
Is the Museum accessible by public transportation? Yes! The Museum is three blocks west from West End Station, which connects to all DART lines, and five blocks north of Union Station, which connects to the TRE to Fort Worth. See this page for maps. The Sixth Floor Museum is a 501 (c)(3) nonprofit organization operated by the Dallas County Historical Foundation. 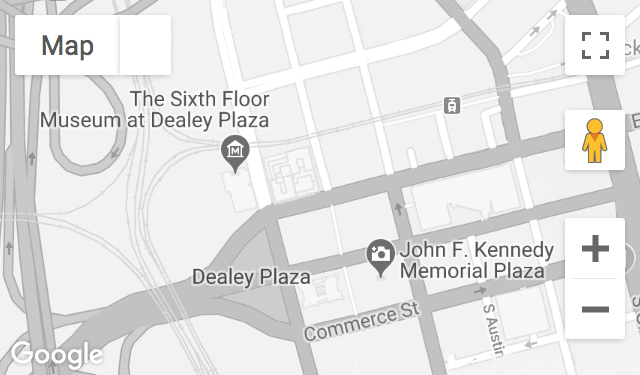 Why is it called The Sixth Floor Museum at Dealey Plaza? A sniper’s perch and rifle were found on the sixth floor of the building after the assassination of President Kennedy. The Museum’s core exhibit is currently housed on the sixth floor. What is the Museum’s annual attendance? More than 400,000 people visit The Sixth Floor Museum on average every year. Why does the Museum charge admission? The Museum is a nonprofit organization and operates almost entirely on revenue received through admission sales. I have a ticket without an entry date and time. Will you accept it? The Museum issues both timed tickets and vouchers. Tickets are valid only for the date and time stated. Vouchers are exchanged in the Visitors Center for timed tickets. The Museum will not accept vouchers or tickets that have passed their expiration date or contain no expiration date. Is the Museum part of Dallas CityPASS? Yes. Save 39% off admission to The Sixth Floor Museum plus three more top Dallas attractions – your best sightseeing value! Buy your CityPASS today at citypass.com or at the Museum Visitors Center. Learn More. Was the Kennedy family involved with the creation of the Museum? No. However, much care has been given to creating a museum that is respectful of the subject matter. Does the Museum attempt to answer some of the lingering questions surrounding the assassination? The goal of the Museum is to recount, as accurately as possible, the history of the assassination, and to identify the major areas of controversy as well as recent developments. Has the content of the exhibition changed as new information on the assassination is disclosed? The exhibitions are regularly reviewed and updated, and new information and artifacts are added periodically. John F. Kennedy and the Memory of a Nation – our core exhibit on the sixth floor – is a self-guided experience. Using the audio guide included with admission, it takes about 90 minutes to go through the exhibit if you listen to everything. The seventh floor occasionally holds temporary exhibits, and exploring those will add a bit of time to your Museum visit. Photography in the Museum is limited in order to protect artifacts and images on display, the copyright privileges of their creators and lenders and the safety and overall experience of our visitors. Visitors are welcome to take photographs from the seventh floor window, outside and in the Visitors Center. Are the tour guides, salespeople and other vendors in Dealey Plaza employed by the Museum? Dealey Plaza is a city property, owned and maintained by the City of Dallas. The Sixth Floor Museum staff are not present in the plaza or adjacent properties, and the Museum is not associated with vendors present in or around Dealey Plaza. How do I obtain permission to reproduce and use text, images, audio or video clips, or other content on this website or from the collections of the Museum? Permission to reproduce content from this website or from the Museum’s collection must be obtained in writing from the Museum. Requests to reproduce material may be submitted online using the Rights and Reproductions Request Form. Does the Museum donate tickets to other nonprofits for fundraisers or charitable events? The Museum is a nonprofit organization with limited resources dedicated to preserving and interpreting the life and legacy of President John F. Kennedy. The Museum does not give away tickets, provide donations for auctions, or otherwise support organizations, groups or individuals for fundraising purposes.